Durability and value are words that continue to resonate with design professionals and customers alike. Future proofing is a recent buzz phrase that describes a product, service or technological system that will not need to be significantly updated in the future. This is extremely relevant for healthcare design in particular. The selection of materials for healthcare projects are a large part of the future success of a building as it ages. One of the past truths about healthcare design was that hospital buildings had a lifespan of 50 years. This means that after about 50 years, the cost of ongoing renovation to a facility equals or surpasses the cost of a full replacement building. Hospital construction can take more than 10 years from planning and design to construction and occupancy. Design professionals’ material choices can be proven to be incorrect even before the first patient ever arrives. 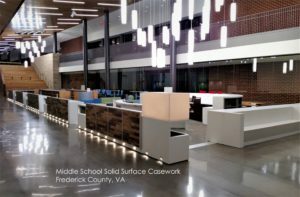 Past experience has shown that the long term life cycle benefits of solid surface provide a better value over other materials. ASST has worked on numerous large healthcare system projects throughout the United States. We can share experiences and knowledge to assist professionals during the design development phase. The goal of healthcare is to heal and to encourage smarter choices for the creation of supportive healing environments.